Achieving either iteration or recursion in Grasshopper would seem to require the use of scripting. 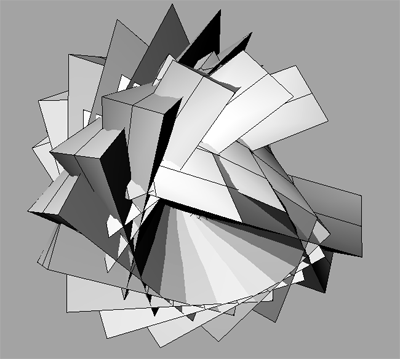 This post will show some of my investigations into iterative methods in Grasshopper without scripting. Grasshopper provides for us a component to calculate N terms of the Fibonacci sequence, but I will calculate it manually here to illustrate the pattern of iteration. First, some initial values are necessary: the first two terms of the sequence, 0 and 1. The function for the Nth term is simply the previous value added to the value before that. Our function thus has two inputs: the (n-2)th value and the (n-1)th value, and two outputs: the (n-1)th value and the nth (the calculated) value. Hooking up the outputs of the function to the inputs of a copy of the same function repeatedly will yield the Nth term of the sequence (with N-2 copies of the function). Given a surface, how do we find a UV domain representing a strip of that surface such that the strip’s area is equal to some desired value N? 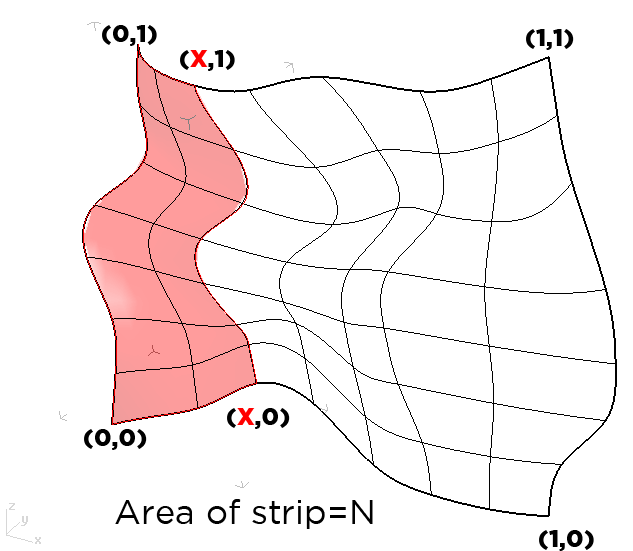 The approach is simply to pick a V coordinate in the middle of the surface (v=0.5), calculate of the area from (0,0) to (.5,1), and then test if it is larger or smaller than the desired area. If it’s larger, pick the next v coordinate to test in the middle of the bottom half (0.25), and if it’s smaller, pick the next one in the middle of the top (0.75). Repeating this process over and over will allow the strip’s area to approach the desired value, and the more repetitions performed, the more accurate it will be. This process could easily be scripted (and in fact I have written such a script) but I show it here as a simple example of this design pattern applied to a real problem. This example does not include a “collector” because all we care about is the final strip, tuned to the proper area, and not all the intermediate steps. Here is a simple example of the use of iterative techniques for complex formal generation. This definition simply takes a BRep as input, and performs a transformation on that BRep, and then performs the same transformation on the result, and so on and so forth. This is another case where a collector allows us to gather the results of each successive step into a list at the end of the process. As I mentioned earlier, fractals are a frequent example of recursion and iteration. The Sierpinski Triangle is a simple fractal that can be constructed easily using this method in Grasshopper. This example also makes more advanced use of data tree structures within a recursive function. As an intern for Radical Craft this summer, I developed an iterative algorithm for approximating a freeform curve with a fixed set of trapezoidal modules. 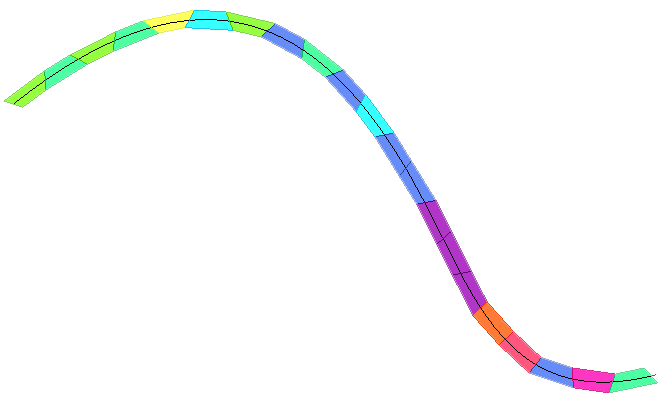 There are only 9 unique shapes, indicated here by the color coding, and the definition selects a sequence of these shapes to construct the best possible approximation of the curve. I can’t share this definition or explain in detail its workings because it was done as part of my work, but as the full project reaches completion I will share more information. In this last example, I am using a much more complex function definition. It essentially takes a BRep as input, rotates it a certain amount around the x and z axes, and folds it across the YZ plane. 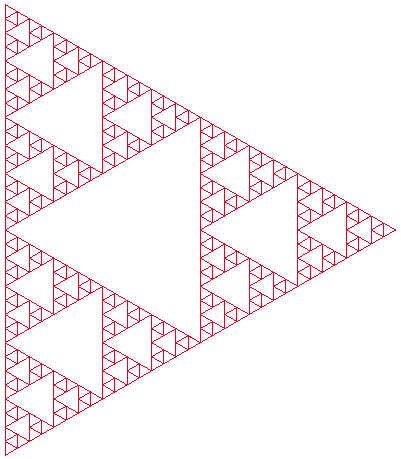 The animation shown here demonstrates the result of changing some of the rotation parameters. All the definitions shown in this post (except example 5) can be downloaded here. Ideally, this process of repeating a group of components could be built into the GH interface. Once clusters (user-defined groups of components) are reinstated it seems to me that it would be fairly easy to design a special component that could encompass a group, and feed its outputs to a copy of the same group N times, or perhaps even until some goal condition was met. I have very little conception of how difficult this would be to add as an interface feature, but I know it would vastly increase the intuitiveness and elegance of solutions such as these, which rely on the repetition of particular processes in an iterative manner. Thats really awesome. This is exactly what i was looking in my project. I’ve been considering iteration and recursion in Grasshopper the last couple of days as I had hit a few walls that required them. I have been weighing learning the ins and outs of scripting in GH to achieve iteration and recursion. It’s one thing to understand a programming language and another to learn how to interact with the constructs of the host program. I think to some degree, we all have copied sections of our definition and reused them over and over and sometimes over and over again, but I really liked your example of using constants to unify them. I think this helped solidify some of the things that I had not yet walked all the way through. As has been stated before the primary drawback to this approach, which is unavoidable in the current state of GH, is that if the “function” needs to be updated it has to be updated in every instance. The other is the large amounts of wire linking in large projects. Thanks! I am really excited to see the way groups of components get incorporated into the “user components” feature David is working on. My hope is that it will resemble the old clusters feature, allowing a real conceptual “black box”-ing of functions. I would think that once this is figured out, adding a feature to allow N connected copies of a given function/cluster (without drawing them all on screen) wouldn’t be terribly difficult. Copies of function clusters could be dynamic instances, eliminating one of the issues you mention. The other, the problem of needing to make many connections per copy, suggests to me the possibility of having some kind of custom data type component, allowing you to define some sort of a compound object or struct that encapsulates data (associated strings, numbers, geometry). The only new components necessary for this would be one to compose an object and one to decompose it (with some variation on the variable inputs/outputs feature seen in several existing components, like the function of N variables). But thinking about how this would work with existing components makes my brain hurt! Yes, this is great. Thanks for it!!!! interesting brep rotation too. 1 System Stalker Lab » Blog Archive » recursion?